One of the good things about being drug out of bed in the dark to be in the field at sunrise is being able to take photos like this one. These ants are out early herding and tending their aphids. 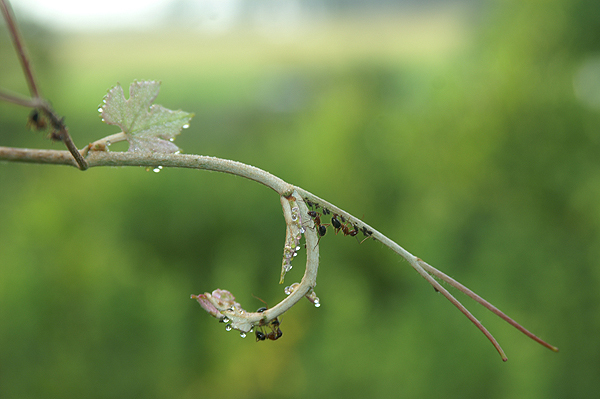 The drops of dew on the wild grape vine tendril highlighted by the sunrise gives an unearthly effect. The reason that the ants tend and protect the aphids is that the aphids secrete a nectar that the ants use for food. This entry was posted on Thursday, May 24th, 2012 at 4:43 pm. It is filed under Animals / Wildlife, Collections and tagged with ants, aphids, dew, farming, grape vine, sunlight, tending, tendril. You can follow any responses to this entry through the RSS 2.0 feed.